Over the past twenty years, Florida’s public school per pupil funding has skidded to the bottom quartile among the states. USA Today ranks Florida at 11th lowest and the numbers are getting worse, not better. In spite of this, the Florida Legislature is now pushing another series of taxpayer funded voucher schemes that move tax dollars from our neighborhood public schools to private and religious schools — some of them pretty sketchy — and all that lie beyond basic accountability, oversight, testing and accreditation. I can’t think of a way to make this complicated: If our tax dollars are shoveled into private and religious schools, then, at the very least, accountability should follow to be certain that the taxpayers get their money’s worth. As it stands, that is not the case. It is important to note that Florida’s private and religious voucher schools do not have to meet state standards required of our public schools. Voucher schools don’t have to hire certified teachers who graduated from an accredited college or university; they are not required to conduct background checks; they can be selective and “cherry-pick” in admissions; nor are they subjected to standardized tests that would allow parents the ability to compare voucher schools to their public counterparts; and more. These unregulated conditions pave the way for “storefront schools” that will popup like mushrooms, enticing parents with publicly funded vouchers and slick marketing and then be gone a few years after profiting. I understand the desire to foster choice. However, direct taxpayer subsidy as a new government-funded entitlement does open up a whole new can of worms. How does one determine if a school is “better” without comparative testing, accountability and earned accreditation? Under the conditions existing in Florida, taxpayer subsidization of religious and for profit schools opens the door for charlatans who don’t have to meet the standards required of public schools and state universities (i.e., transparency, certified personnel, accreditation, background checks, etc.). Many Americans also argue that tax dollars should not be used to subsidize religious indoctrination, no matter the deity or dogma. They don’t want their taxes funding religious proselytization (e.g., teaching Noah’s ark as science, creating Islamic Madrasa schools, etc.). Folks don’t want to pay for that with their tax dollars. Certainly, parents can choose to inculcate a religion, but the public shouldn’t have to pay for it. Private and parochial education might be made more available through private scholarships or through private foundations or by the churches, temples and mosques themselves. But public funds should go to public schools and not to help subsidize for-profit or parochial schools. Like most folks, I believe that tax dollars should not go to untested and unregulated educational enterprises. Nor should it go to religious schools. In my estimation, this “school choice” legislation creates more harm than good and is weighed-down with unintended consequences. What is particularly odd is that if one looks up the biographies of individual legislators, one finds that the overwhelming majority attended public schools and state universities. If public schools worked for them, their parents and grandparents, then why would they turn their back on Florida’s underfunded public education system now? Why are they looking to shove Florida’s public school money into unregulated private schools? To answer those questions, voters need to follow the money and see where it goes. Throughout modern history, investment in America’s system of public schools and universities has contributed to our nation’s greatness, including helping build the largest, expanding peacetime economy in world history. Let us use our tax money to fix our neighborhood public schools with proper financing that approaches the national average in per pupil funding. 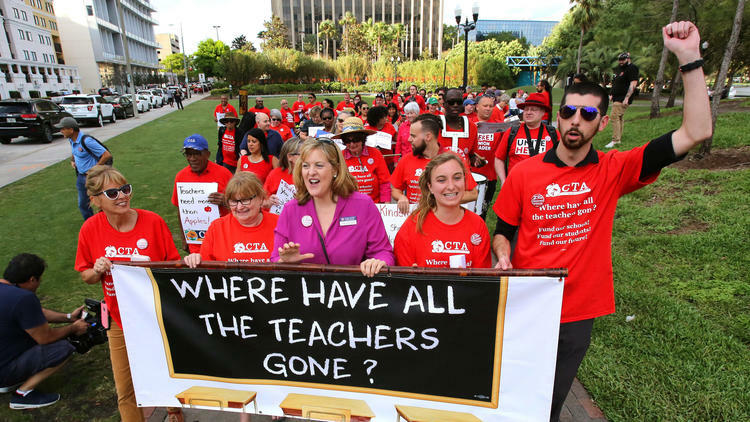 Let us attract and retain incredible professional educators with competitive salaries, strengthen security and reassure the public that our public schools are a long-term investment in our community, state and nation.